I can almost hear you asking “what on earth is a Wimbledon Cake?”. I won’t keep you in suspense any longer! 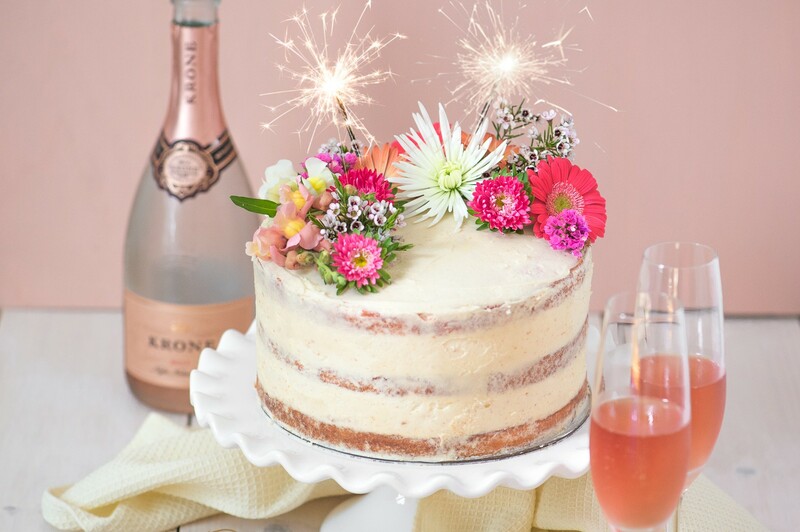 The inspiration for this cake evolved from a beautiful bottle of Rosé bubbly that I had. It was crying out to be used it in a dessert recipe (obviously) and a light and airy cake seemed to suit the fizzy champers perfectly. Such an epicly flavoured cake deserved an equally grand filling, so I settled on a Swiss Meringue Buttercream (if you haven’t tried SMB yet, do yourself a favour!). Then just to add a burst of freshness I added some sliced strawberries to the filling. Once I’d finished putting the recipe together I realised I had all the flavours of a day out at Wimbledon – champagne with strawberries and cream! And so the name “Wimbledon Cake” was born. 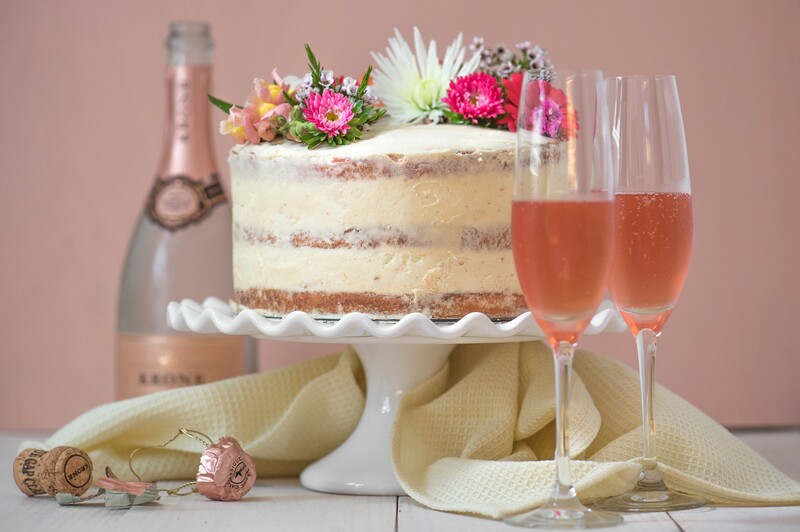 The texture of the Champagne cake is as-light-as-air thanks to the extra bubbles from the champagne and using egg whites only. The Swiss Meringue Buttercream has a super creamy, smooth texture – almost like a thick whipped cream but more stable. It’s infused with a delicate champagne flavour and is far less sweet than traditional buttercream. Fresh strawberries lighten the filling and add a little suprise when you slice through the cake too. And if none of this has won you over, just look how pretty it is! PS. This recipe does use rather a lot of egg whites! Put the leftover yolks to good use by making a delicious Lemon Curd or Crème Brûlée. Preheat the oven to 180°C. Grease and line 2 x 20cm cake tins with greaseproof paper. To make the Champagne Cake, cream together the butter and sugar until pale and fluffy, about 5 minutes, then beat in the vanilla essence. In a separate bowl, gently whisk the egg whites until just foamy, then gradually add to the butter mixture, beating well after each addition. Sift the dry ingredients together, then add to the mixture in three batches alternately with the milk, mixing lightly inbetween and scraping down the bowl. Mix just until combined, do not overmix. Lastly fold in the champagne and a few drops of food colouring if desired. Divide the mixture into 3 equal portions (I weighed the mixture to ensure each layer would be the same). Bake 2 layers at a time, for 25-30 minutes, or until a skewer inserted comes out clean. Leave to cool in the tin for 5 minutes, then remove to a cooling rack to cool completely. Repeat with the remaining batter. To make the Swiss Meringue Buttercream, heat the 250ml champagne in a small saucepan to a simmer. Continue heating until the liquid is reduced by half. You should now have 125ml of a champagne reduction. Set aside to cool at room temperature. Place the sugar and egg whites into a heat proof bowl set over a pan of simmering water. Whisk the mixture constantly (but not too vigourously) until the egg whites are hot and all of the sugar has dissolved. To test this, rub the mixture between your fingertips – it should not be grainy at all. Remove from heat and use an electric or stand mixer to whip the mixture until the meringue is thick and glossy, and the bowl is room temperature (this can take up to 10 minutes so a stand mixer is a huge help here). Now with the mixer on low speed, add butter cubes, one at a time, until incorporated, and mix until it has reached a silky smooth texture. I find this easier to switch to a paddle attachment for this step. Generally the mixture will curdle at some point, but dont panic! Just keep mixing and mixing and it will eventually become smooth and creamy. If it is still curdled after mixing for a while, and looks runny, the mixture is too warm. Place in the fridge for 15 minutes, then mix again. If it is still curdled and there are lumps of butter visible, the mixture is too cold. Briefly place the bowl over the pan of simmering water and try whisking again. Add the champagne reduction (at room temperature) and continue to beat on low speed until well combined. Once the cakes have cooled completely, place 1 layer on your serving dish. Spread a thick layer of the Swiss Meringue Buttercream on top, then cover with a layer of strawberry halves. Spread another thin layer of the buttercream on top of the strawberries so that the next cake layer will stick. Place the second cake layer on top and repeat the filling. Lastly place the third layer on top and spread some buttercream on. Use a palette knife to spread a little buttercream onto the sides of the cake and scrape it on evenly. You are essentially only doing a “crumb coat” so the cake layers should still be visible. 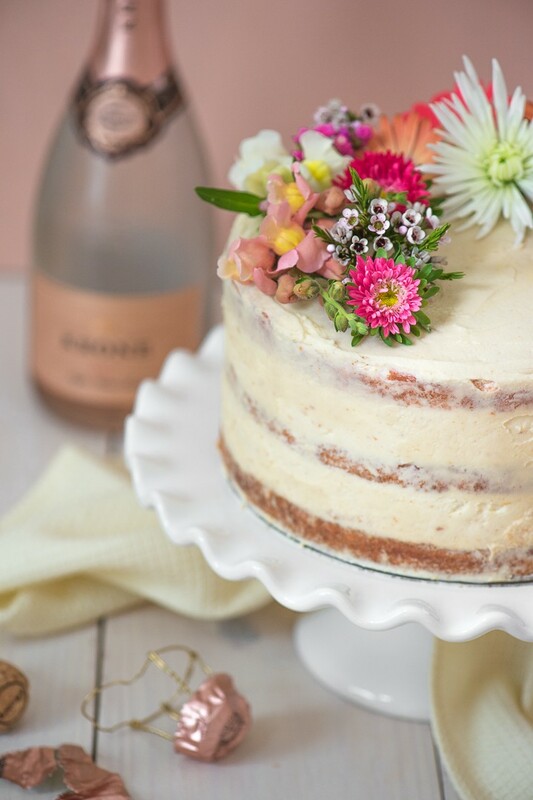 Lastly, decorate the cake with edible flowers, and a few sparklers if you like! Serve with a chilled glass of champagne!